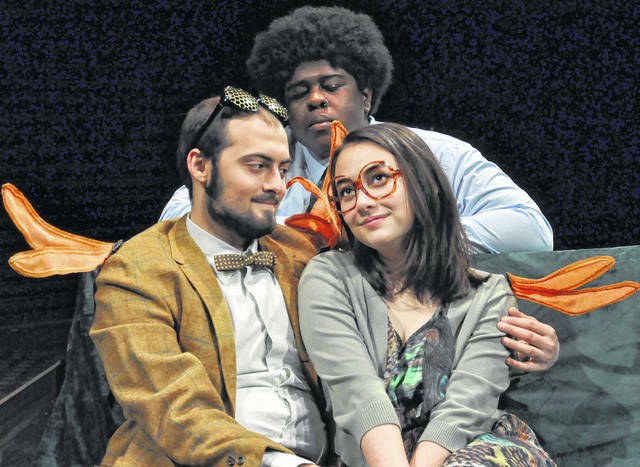 Max Haupt and Jasmine Lew (front), and Michael Sutton perform playwright David Ives’ “Time Flies” as part of Ohio Wesleyan University’s “Just One Step” theatre and music production. The show will run Feb. 21-24. Courtesy photo | D. Glen Vanderbilt Jr.
Ohio Wesleyan University’s Theatre & Dance and Music departments will take to the stage Feb. 21-24 with “Just One Step,” a twin bill of short comedies by American playwright David Ives and music by American composer and lyricist Jason Robert Brown. Both portions of the show feature material that explores people on the verge of big decisions or actions in their lives. “Just One Step” opens Thursday, Feb. 21, and runs through Saturday, Feb. 23, at 8 p.m., and it concludes Sunday, Feb. 24, at 2 p.m. All performances take place in the Studio Theatre inside Ohio Wesleyan’s Chappelear Drama Center, 45 Rowland Ave., Delaware. The production is supervised and the plays are directed by OWU theatre professor D. Glen Vanderbilt Jr., who also provides scene design. OWU alumna Zoe Crankshaw, class of 2015, is serving as lighting designer, and costume shop manager Jacqueline Shelley is creating the costumes. Theatre major Logan Kovach, class of 2021, is serving as stage manager for both acts. The cast for the plays is OWU students Catherine Giacalone, Ares Harper, Max Haupt, Caitlin Hyatt, Rose Jonesco, Jasmine Lew, Josh Martin, Jack Riter, Michael Sutton, Hannah Wargo and Margaret Welsh. For Ives’ plays, the point of view is consistently comic, yet wistful, Vanderbilt said. In “Sure Thing,” a couple meet in a café for the first time and keep experiencing déjà vu on their way to agreeing to a second get-together. “Philip Glass Buys a Loaf of Bread” is a surreal vignette about the American composer having an existential crisis in a bakery. In “Time Flies,” two lonely mayflies meet, are attracted to each other, and realize they don’t have much time before making a big decision. And, finally, “Degas, C’est Moi” is a whimsical day-in-the-life of an urban everyman who makes some key realizations about his life and art. The music portion of the show, produced by the Department of Music’s Opera Workshop, features selections from composer Brown’s song-cycle “Songs for a New World.” It is directed by OWU music professor Jennifer Whitehead with musical preparation by professor Jason Hiester. Brown’s work explores the “Just One Step” theme from multiple points of view with the ensemble cast. What do Christopher Columbus, a suicidal socialite, and Santa’s wife have in common? They are a few of the characters in “Songs for A New World,” which features not one story but many. Brown’s “New World” is a revue of varied and memorable solos and ensembles, each telling its own narrative, and featuring characters and situations connected by one universal theme – the reality, fear, and exhilaration of decision-making. Brown’s characters are as real and sympathetic as his music is poignant and memorable, Whitehead said. The audience is invited to jump into the passenger seat for their journeys, and learn about themselves on the ride. The cast for the song cycle is OWU students Ares Harper, Miko Harper, Rose Jonesco, Jasmine Lew, Josh Martin, Jack Riter, Jasmine Spitzer, Hannah Wargo and Austin Wood. General admission for “Just One Step” and all Ohio Wesleyan Theatre & Dance productions is $10. Admission for senior citizens, OWU faculty/staff, and non-OWU students is $5. Admission is free for Ohio Wesleyan students with a valid university I.D. Admission on Feb. 22 is free for all OWU employees. Reservations are encouraged, and because of the limited, intimate seating, latecomers may not be able to be seated until a suitable break in the action. Please note, this production includes some contemporary language and is not recommended for young audiences. Call 740-368-3855 for reservations or visit http://theatre.owu.edu/ for more details. https://www.delgazette.com/wp-content/uploads/sites/40/2019/02/web1_Ohio-Wesleyan-University-2c-27Time-Flies-27-Photo-by-D.-Glen-Vanderbilt-.jpgMax Haupt and Jasmine Lew (front), and Michael Sutton perform playwright David Ives’ “Time Flies” as part of Ohio Wesleyan University’s “Just One Step” theatre and music production. The show will run Feb. 21-24. Courtesy photo | D. Glen Vanderbilt Jr.